Natural History filmmaking has a long history but the generic boundaries between it and environmental and conservation filmmaking are blurred. Nature, environment and animal imagery has been a mainstay of television, campaigning organisations and conservation bodies from Greenpeace to the Sierra Club, with vibrant images being used effectively on posters, leaflets and postcards, and in coffee table books, media releases, short films and viral emails to educate and inform the general public. However, critics suggest that wildlife film and photography frequently convey a false image of the state of the world’s flora and fauna. The environmental educator David Orr once remarked that all education is environmental education, and it is possible to see all image-based communication in the same way. 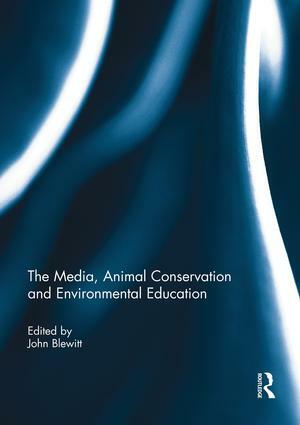 The Media, Animal Conservation and Environmental Education has contributions from filmmakers, photographers, researchers and academics from across the globe. It explores the various ways in which film, television and video are, and can be, used by conservationists and educators to encourage both a greater awareness of environmental and conservation issues, and practical action designed to help endangered species. This book is based on a special issue of the journal Environmental Education Research. John Blewitt co-directs the MSc Social Responsibility and Sustainability course at Aston University, UK. He has published widely on education, the media and sustainability, and is a member of the IUCN Commission for Education and Communication. He is author of Media Ecology and Conservation (2010) and Understanding Sustainable Development (2008).